The Aujäger, originally a hunters lodge, is located in the countryside 30km south of Munich about 150 metres from the Isar river, shortly before the small village of Puppling. While the lodge was established in 1690, it is believed that a restaurant opened at the location in 1810. The current owner's great grandfather bought the property in 1931 and continued running a restaurant and beer garden. Today, a traditional Bavarian guesthouse with 15 rooms is also part of the property. The self-serviced area between the main buildings and the road is partly shaded by large chestnut trees. The location has a village square feeling, complete with a Maibaum and a postal box in case anyone needs to send a letter. Over the road, there is a field where horses can usually be seen grazing. There are 500 seats in the self-serviced area and about 50 seats in the serviced area behind the main building. Aujäger is a popular stop-by amongst bikers cycling the Isar route between Munich and Wolfratshausen. The beer garden is most busy during warm summer evenings, especially by visitors after having spent a day swimming at the Isar. 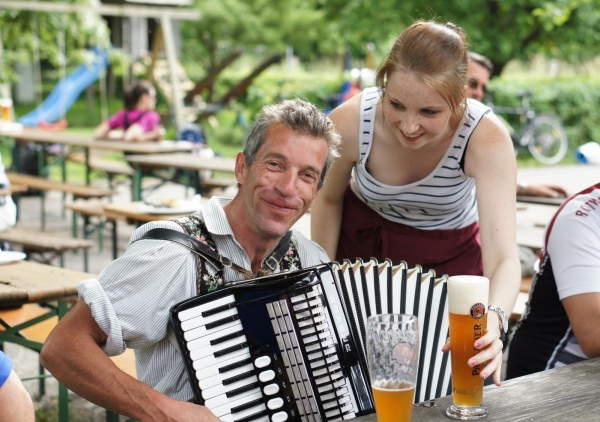 The traditional Bavarian band Gmahde Wiesn performs on a small stage in the beer garden approximately every second month. On Sundays Steckerlfish (grilled fish on a stick) is prepared in the beer garden using fresh trout from the nearby Aumühle fish farm. The beer served is Hacker-Pschorr and the price for a Maß is €6.60 (July 2017). The Aujäger beer garden is open Wednesday to Sunday from 10am until about 11pm. On weekdays the self service food stall opens around 4pm or 5pm. Before then guests in the self-serviced area can fetch their beer from the restaurant. The beer garden and restaurant is closed on Mondays and Tuesdays.